Kojiro sat impatiently on the small island off the coast of Japan known as Ganryu. His mind, originally intent on killing a young upstart that dared to insult him had become preoccupied, with his own discomfort. Now he was tired, pissed off and angry that he had been sitting there for hours, well past the appointed time for the vagabond to show himself. The sun, with its insistent glare, rising in the afternoon, caused the sweat to steam down his brow, stinging his eyes. Blinking, he saw a small boat wind its way to the island, carrying with it this pathetic young urchin that had compounded his insults and slights against Kojiro in showing up hours late for their dual. As the boat approach the shore, Kojiro saw that he was insulted once more, for instead of clutching a katana in his hand this dirty poorly dressed scruffy excuse for a warrior carried nothing but a boat oar that he had carved into a crude sword. The oar wielding scruff silently stepped from the boat, and the infuriated Kojiro screamed in anger throwing his scabbard into the sea. At this moment the scruff looked up, smiled and shouted defiantly, “You’ve lost Kojrio, only a dead man has no need of his scabbard!” Moments later Kojiro lay dead, his skull and chest crushed in the most famous victory of the Sword Saint, Miyamoato Musashi. 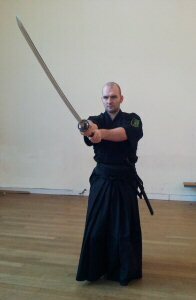 But this isn’t a story about legendary fighters, nor is this about the Samurai (not that Musashi was one), no this story is about today, and the remarkable quest I began in mid January in the Kenseikai Iaido Dojo, down Magennis Place, Pearse St, during an Iaido class. And perhaps this is a story that you’ll be able to share. And speaking of stories wasn’t Musashi’s fight against Kojiro a cool intro? But the coolness belies a very important lesson, that of “Kachi wa saya no naka ni ari”, or translated, “Victory comes while the sword is still in the scabbard”. What Musashi demonstrated in his battle against Kojiro was an understanding of psychology, or perception and something I would later learn is a key component in Iaido. Musashi knowing the temperament and pride of his opponent achieved victory by mentally throwing him off balance, and arriving late. But this was not enough, he further flustered Kojiro in being late and bringing an oar to a duel, as such Kojiro reacted in anger and could not apply rational thought or strategy to his fight – instead of remaining cool and composed, Kojiro lost it, and as a result lost his life. 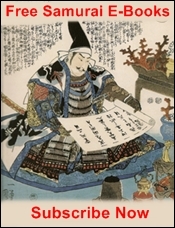 Now I am greatly over simplifying this, the student of Musashi would quickly point out that the legendary fighter had studied his opponent and knew well that Kojiro prided himself on the use of an extremely long sword and his advantage was in distance, thus Musashi’s choice of an oar that he carved into the shape of a sword – a longer sword than Kojiro’s. Also they would be quick to note the strategic significance of the position that Musashi arrived in, his back was to the sun, and thus Kojiro’s eyes were blinded, and of course there was the psychological advantage in pointing out Kojiro had already lost…and there are more factors besides. Ultimately however they all contributed to Musashi’s victory, one that was inevitable, one that he had achieved the night before on his decision to arrive late for the match. Musashi had won the bout long before either he or Kojiro had drawn a weapon. 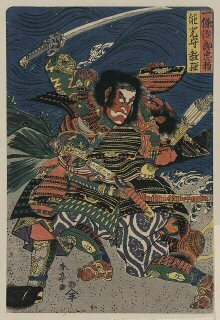 It was however as a result of this fight that Musashi began looking for different answers from the martial arts, from his life. Knowing now that he was unbeatable in combat, that he could kill a skilled opponent with ease Musashi began a different quest, he would never kill in a dual again, instead simply showing his opponents the ineffectiveness of their rigid devotion. Instead Musashi looked towards understanding himself and his place in the world, to bettering himself as a man and searching for Heijoshin – inner peace. There’s a reason stories like Musashi’s are so powerful, while to a degree historically accurate they are made more dramatic, to convey to us the underlying theme’s that we can see in our own life. In this respect Musashi’s story is applicable to all of us, much in the same way all great legends are from Homer’s Odyssey, to modern myth and cinema. And in listening to the story of Musashi above you may find a familiar truth as I have. All be it a less dangerous and violent way, I’ve come to a similar decision as Musashi after the death of Kojiro. I recently wrote in another article published in Irish Fighter that I had finally found my answers, those that began my journey in the martial arts so long ago. And I have, thanks to my study of reality based self defense and in particular Jim Wagner's Reality Based Personal Protection and Tim Larkin’s Target Focus Training, I know how to stop the unstoppable attacker, the terminator that keeps coming, and I’m not afraid anymore. I’ve gone on at length about the benefits in a previous article and I won’t do that here, but I have completed the quest I set out to when I began. In some small way like Musashi, I’ve learnt that I can kill and I don’t need to follow that path any more. Like Musashi, in my martial journey, I’ve encountered other concepts through the martial arts. I loved the traditional arts, the discipline, the eastern philosophical concepts, the quest for precise control over the body with the mind. And now that I have my answers I find that I miss those aspects, the ability to make yourself better, to hold a mirror to yourself, to see the flaws and cut them away through intense dedicated training. So, after 5 years training exclusively in Reality Based combat systems I’ve gone back to traditional arts, not to learn how to defend myself, but to learn how to the best person I can be. And this I suspect will be a longer and harder quest. This is a quest for Hejioshin, inner peace and balance. I am trying to understand myself through movement, but what movement that was the question. I’ve gotten all I could from Karate, the same is true of Aikido, in fact having studied many of the martial arts I was lost to find one that I felt would suit this new goal. But I found one in Nick Johnston’s Iaido Dojo in the Martial Arts academy. 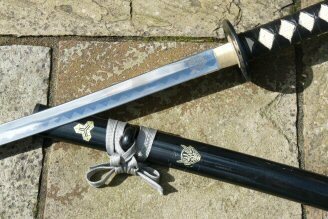 Iaido is a Japanese martial art, and the particular branch taught in Johnston’s Iaido Dojo, is Musō Jikiden Eishin-ryū (無双直伝英信流). 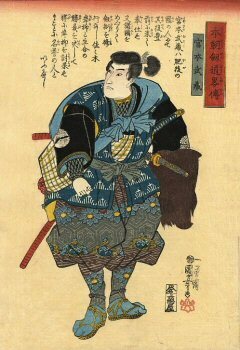 It originated roughly around 450 years ago, with a man named Hayashizaki Jinsuke Minamoto no Shigenobu (林崎甚助源の重信). The art’s name translates as Peerless Directly-transmitted True-faith Style. Originally referred to as Shimmei Muso Ryu, or Shin Muso Hayashizaki Ryu, this name is derived from the legendary origins of the art. After the death of his father in a duel, the then 26 year old Hayashizaki prayed devoutly to Hayashi Myojin for 100 days and received divine inspiration resulting in this particular school of sword drawing that we know today as Iaido. 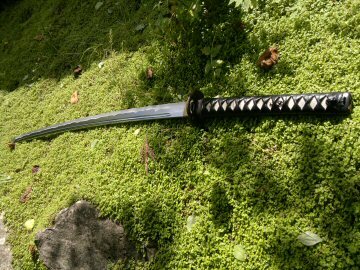 This is essentially what Iaido is regardless of particular style or interpretation, it is the art of removing the sword, the katana from the scabbard (saya) and cutting in one movement. This is referred to as Nukitsuke. It is a beautifully simple art and yet infinitely complex – much like life. And in fact Hayashizaki based his style on the flow and movement of life, of Yin and Yang – something that as an acupuncturist I strongly identify with and he taught Iaido with this spiritual context in mind. While this focus on lineage and history may be tedious reading for some – it is a unique and well documented account of the history of the style and truly places in context the teachings one trains in. With the proliferation of dubious martial arts that are spawned by McDojo’s around the world it is a privilege to have a clear and defined lineage to one’s art, to be able to place onself in that history and development. You have the opportunity to become part of and contribute to something greater than yourself. It’s also important in terms of having a good teacher and instructor and in this case I can run through 20 generations of grandmasters and soke’s to a direct lineage in Iaido to my instructor Nick Johnston and his Iaido Dojo. Training in Johnston’s Iaido dojo is unique, as the classes are divided between himself and Bjorn Fehr. This provides excellent opportunities for students of both Iaido, and of life, as you are presented with two distinct philosophies and mindsets towards the art. Each instructor presents the fundamental material of the Koryu (the traditional styles as taught and passed down), with his own distinct flair and thought process behind it. The result is a living breathing art, exacting in its execution, yet capable of individual interpretation and unique identity. Training itself can be broken down into distinct and separate parts that when you get better form a fluid whole. The main distinctions of Iaido are the initial draw of the blade and cut in one movement – Nukitsuke, the killing blow - Kiritsuke , the traditional gesture of flicking the blood of a fallen opponent off the blade, Chiburui, and finally the re sheathing of the blade in one elegant motion – Noto. Each of these techniques has variations, subtle movement and mannerisms, blended with psychology and intention. Brought together they form a unified whole – a kata, or form. Both Johnston and Fehr take different approaches to teaching and performing these movements in the Iaido Dojo. Training with Fehr is Yin, he demonstrates a beautiful fluidity in the movements and encourages contemplation and thought within each movement leading to a natural elegance. Careful coaching and delicate direction slowly transitions the student from conscious ignorance of technique through to conscious competency and finally to unconscious grace where a unique symmetry of total free natural movement occurs within a rigid prescribed context. While this may sound contradictorial, it is in one sense the very essence of the art. There is deep emotion within the vacant expression of the Iai practitioner, as he is resigned to the ultimate execution of his opponent, regretting the end of human life, but focusing on the act with quiet determination and strength, without hesitation and performed with a grace befitting of the respect for human life. This contrasts with Johnston’s own Yang interpretation of Iaido. While Fehr’s movement is beautiful to watch, nearly balletic, Johnston performs the movements with a spiky aggression that at times I find nearly uncomfortable to watch. Nick’s performance of the kata is committed with such focused intent, I often feel a sense of cold uncomfortibility on the back of my neck as the depiction of death is so well executed I can nearly feel the blood of the fallen opponent pooling at my feet. Each movement of Nick’s performance is measured, weighted and imbued with fierce intent. His eyes cold, calculating and deadly in a grim expression, each slice of the blade kills. An awareness of every person in the room threatens yet his focus is solely on the man he is cutting down in this ritualized display. The tension is palpable, no one breaths and he rises slowly from delivering the last fatal blow, his eyes looking at the imaginary fallen opponent. Unflinching he re-sheathes his sword, silently aware of everyone and everything in the room, yet his eyes haven’t moved from where the body would lie. Watching, waiting he steps back, his eyes come up, and you’re left relieved it’s over. That’s when you let the breath you’ve been unconsciously holding out. 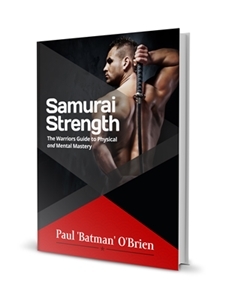 His teaching method is similar – a clinical breakdown of the movements and detailed focus on each aspect that then brings everything together in perfect execution. The differences between both instructors are subtle, but definitive - a hand position, a hip movement, the focus on the eyes and the non physical intention. Where Fehr is resigned, Johnston is ruthless, where Johnston is aggressive and dominating, Fehr manifests quite confidence and power. Where Johnston is sharp and explosive, Fehr is flowing and elegant. Each performs the kata within the Iaido Dojo in his own way, a product of his teachers and lineage and their own personal philosophies. The result is perfect balance and students get to experience both and thus can make their own decision about which path to take, ultimately in the hopes that at some point down the road they can forge their own path, explore their own personal philosophies and understand how they relate not only to themselves but their world. In the Iaido Dojo however this art is more than simply swinging a sword around in various patterns. It is, as you may have gathered, a tool that once can use to shape and perfect one’s character, to find and accept those aspect that and weak and those that strong within oneself. Iaido is simple in concept and yet incredibly challenging to perfect. In today’s increasingly stressful world, in one in which everyday peoples virtues and manners and compromised by greed and weakness Iaido and training in an Iaido Dojo is the perfect foil for life, for understanding oneself and one’s place in the world – through the sword one cut’s away the unessential until all that remains is the truth – and with that peace of mind – Heijoshin..